Just days before the 100-day mark of the Trump administration, we were presented the outline of what is being called “the biggest tax cut” in US history. 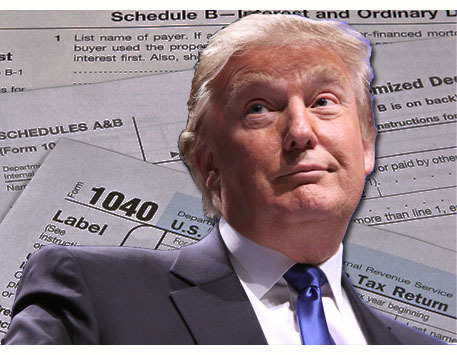 Trump’s tax reform calls for big cuts in federal taxes for businesses and a simplified basis for individuals. But what exactly does this big news mean for investors? Even a minor decrease in tax rates on businesses can have a big benefit on their bottom line. Rather than use the extra money for expansion or other projects, it is likely that companies would use those dollars to increase stock buy-back or raise their dividend. The end result: more wealth for shareholders. With more favorable tax rates on corporations, foreign companies will be more inclined to increase business within the Unites States. More companies will begin production domestically rather than seeking international options, which in turn will drive U.S. economy upwards. Personal tax rates are projected to become a whole lot more simplified changing the existing seven brackets down to three; 10%, 25% and 35%. Income ranges for these amounts have yet to be announced, however; the proposed rates would ease the tax burden on most Americans, freeing up dollars to be invested. In addition to lower personal tax rates, Trump wants to double the standard deduction for individuals. This would look like a deduction of $24,000 for a married couple. Essentially this means that the first $24,000 earned is not taxed. This creates yet another tax savings for individuals, and more dollars in the pockets of tax-payers. The proposed plan lowers the capital gains tax from 23.8% to 20%; eliminating the portion that is used to fund the Affordable Care Act. This reduction makes investing in the stock market much more attractive. While companies begin to save money on taxes and drive their market share, it is going to force investors on the sidelines to take part in the market gains. Extra money in the consumers pocket due to having a smaller tax burden will also contribute to a market up rise; while having a smaller burden on the backend when it comes to capital gains. Kristi Desepoli is an associate financial advisor at Heritage Financial Advisory Group. Heritage specializes in investment management and financial planning for business owners and executives.